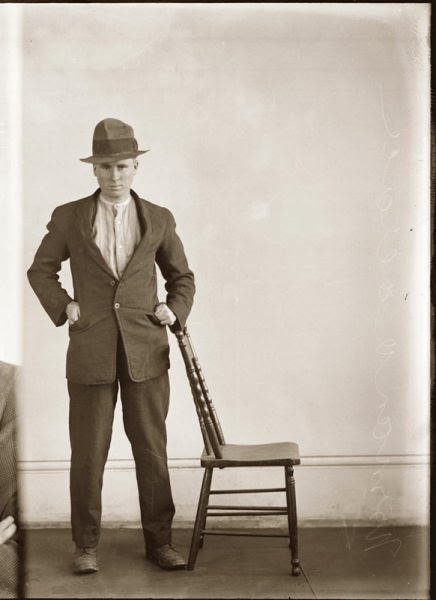 The New South Wales police department took over 2500 photographs of its inmates between the years of 1910 and 1930. Here are some images from the collection as well as the stories that go with them. 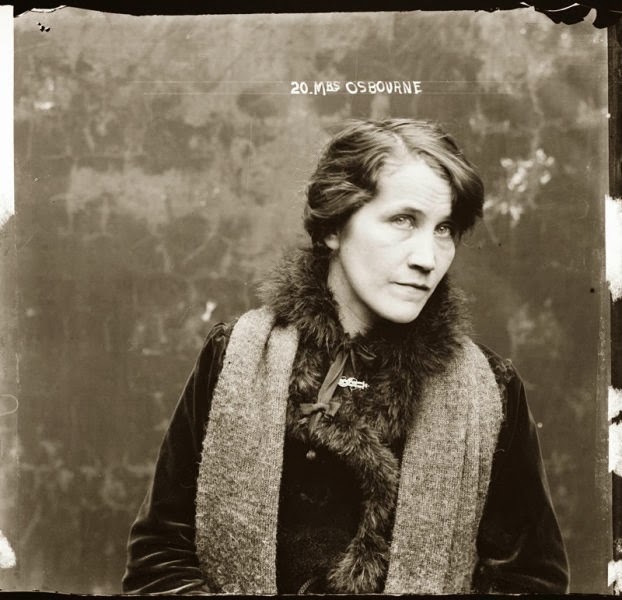 This negative was found wrapped in a paper sleeve on which is written: ‘Group of criminals, Central 1921′. The subjects are not named, but the woman on the left is believed to be Eileen Leigh or Barry (daughter of Kate Leigh). The man on the far right in the back row may be Stephen Doyle, and the man to the left of him Kenneth McLelland (or McCrerrand). 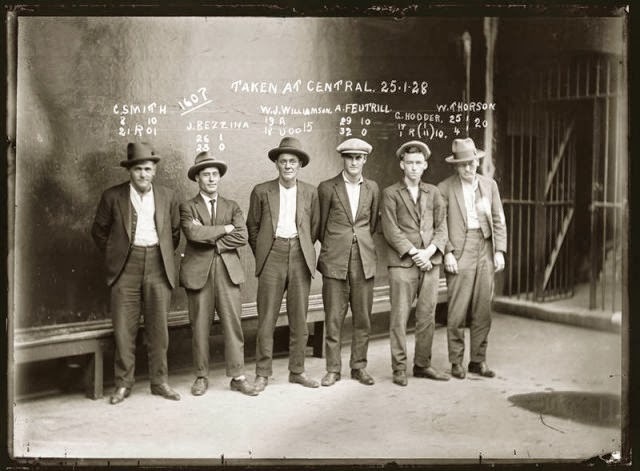 The man third from the left in that row may be the pickpocket and three-card trickster known as Frederick Mewson, and the man far left in the front row is likely the pickpocket known as Norman Smith. 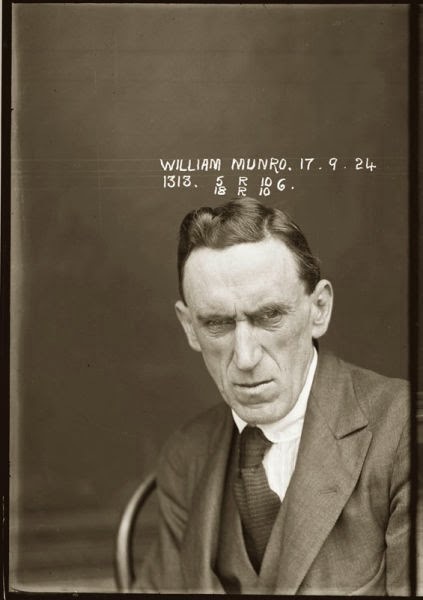 Hunter is listed in the NSW Police Gazette, 1924 as charged, along with William Munro, with receiving stolen goods to the value of 536 pounds 4 shillings and 1 penny, the property of Snow’s department store. 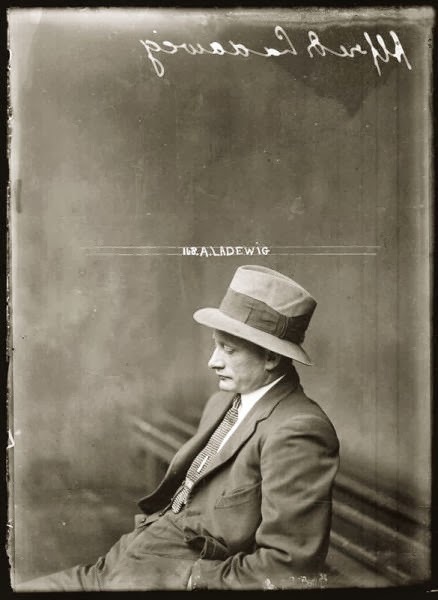 Alfred Ladewig, alias Wallace, John Walker, Atkins; charged on provisional warrant with stealing by trick the sum of 204AUD, at Brisbane, the property of Alfred Walter Thomlinson. 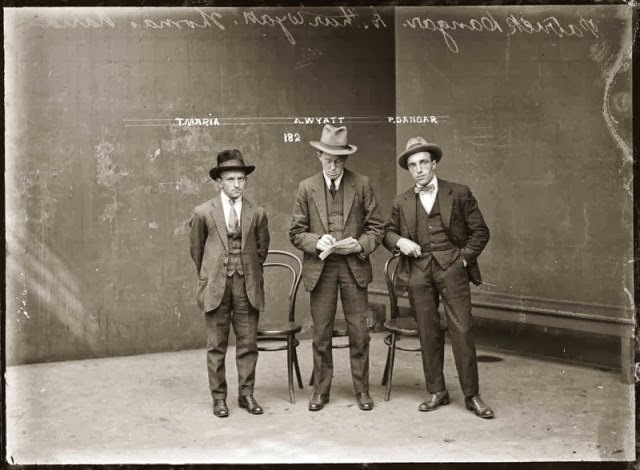 Arrested by Detective-constables Matthews and Jones, and Special-constable Bladen, Sydney Police. 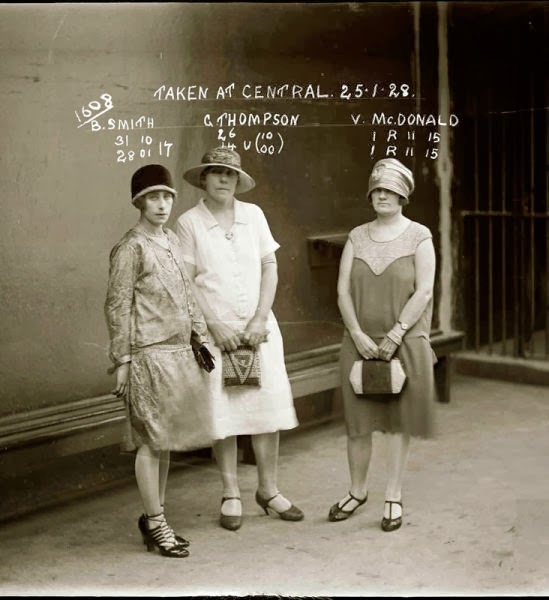 Vera Crichton, 23, and Nancy Cowman, 19, are listed in the NSW Police Gazette 24 March 1924 as charged, along with three others, with “conspiring together to procure a miscarriage” on a third woman. Crichton was “bound over to appear for sentence if called upon within three years”. Munro is listed in the NSW Police Gazette, 1924 as charged, along with Harris Hunter, with receiving stolen goods to the value of 536 pounds 4 shillings and 1 penny, the property of Snow’s department store. 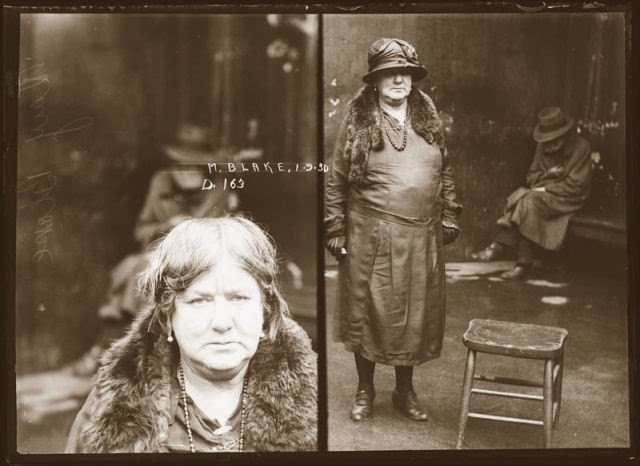 The names inscribed here do not appear in police records for 1920-21, and it is likely the women were photographed simply because they were found in the company of known criminals. A copy of this photograph has been sighted elsewhere in police archives, in which the figure here labelled ‘D Morgan’ is additionally annotated ‘lives with Paddy Brosnan’. Special Photograph no. 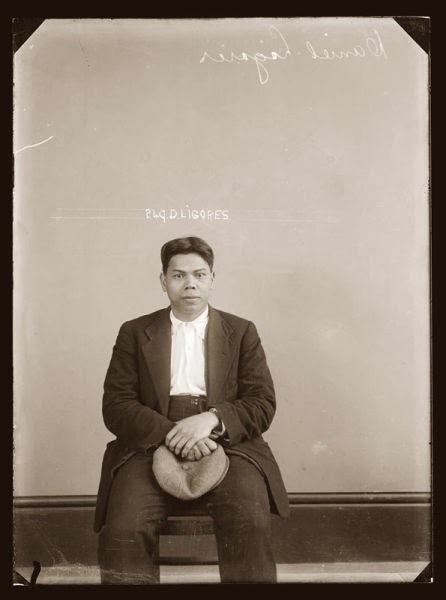 D62 (Drug Bureau photograph): An ‘Ah Chong’ is listed in the NSW Police Gazette of 21 June 1922, convicted of two charges of receiving, for which he received 12 months hard labour. 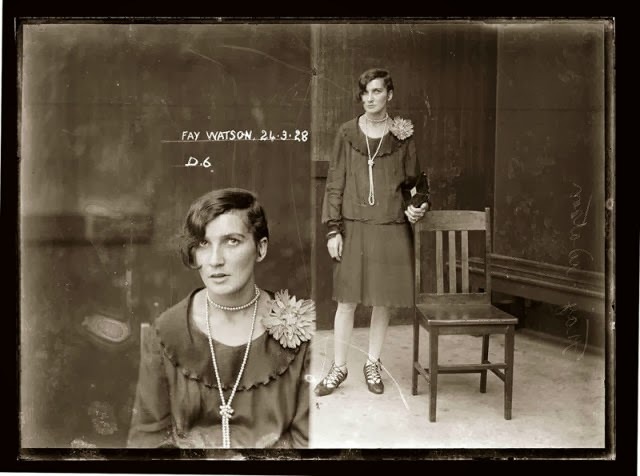 Although no record for Fay Watson is found in the NSW Police Gazette for 1928, the Sydney Morning Herald (26 March 1928, p. 12) reports her arrest in a house in Crown Street, Darlinghurst, and subsequent conviction for having cocaine in her possession, for which she was fined ten pounds. 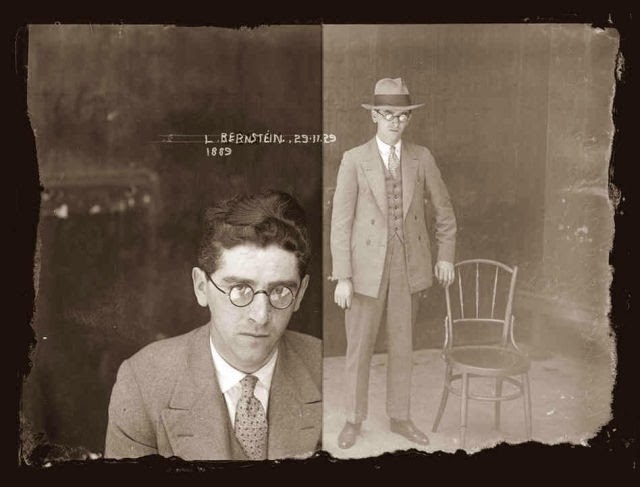 Bernstein (under the alias “L Berman”) was the subject of a warrant issued in early 1929 charged with obtaining a diamond ring value 14 pounds by false pretences from an Oxford Street jeweller. 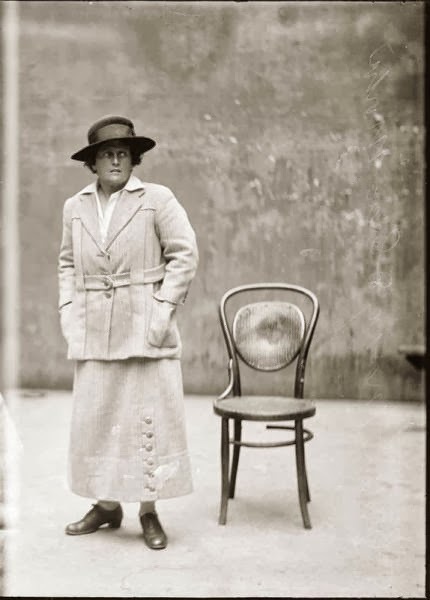 In April 1930 he was further charged, along with Patricia Irving, with ‘conspiring … to cheat and defraud divers members of the public of divers large sums of money’, for which he was sentenced to 18 months hard labour. 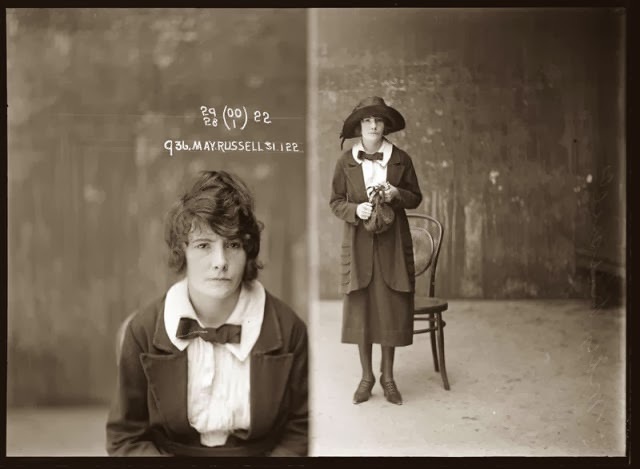 Valerie Lowe and Joseph Messenger were arrested in 1921 for breaking into an army warehouse and stealing boots and overcoats to the value of 29 pounds 3 shillings. The following year, when this photograph was taken, they were charged with breaking and entering a dwelling. Those charges were eventually dropped but they were arrested again later that year for stealing a saddle and bridle from Rosebery Racecourse. 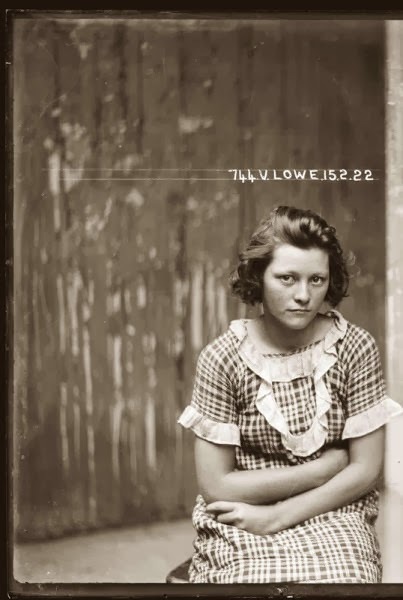 In 1923 Lowe was convicted of breaking into a house at Enfield and stealing money and jewellery to the value of 40 pounds. Smith and Jones are listed in the NSW Police Gazette as charged with stealing seven packages of twine (value 14 pounds). 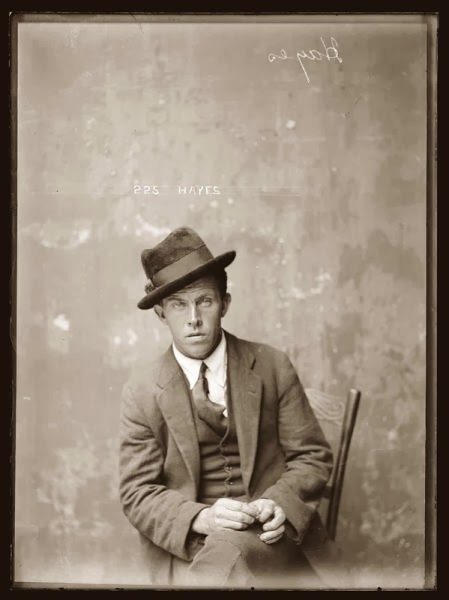 Jones was further charged with stealing thirty horse rugs (value 15 pounds) and two bales of kapok (value 20 pounds). 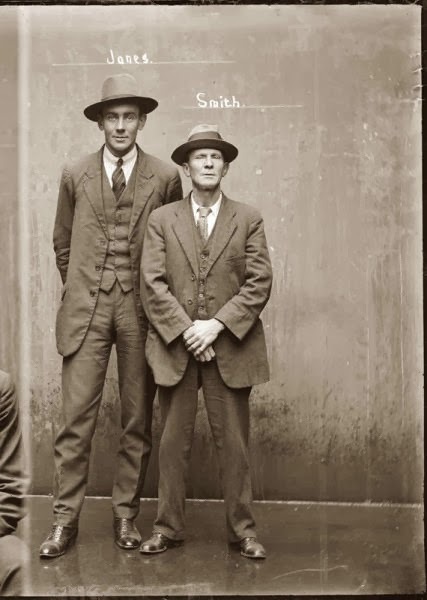 Smith was fined 20 pounds; Jones was sentenced to 18 months hard labour, suspended. 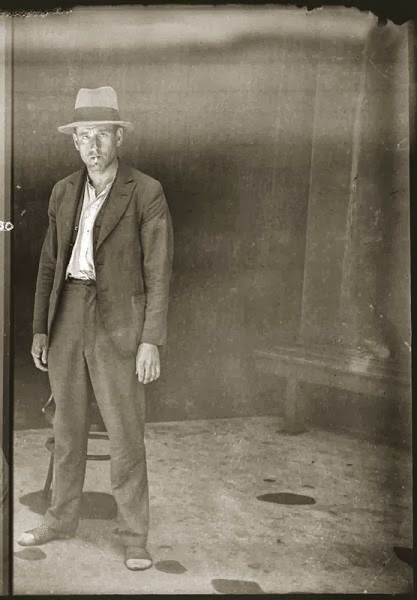 When this photograph was taken Alfred Fitch was a car thief. 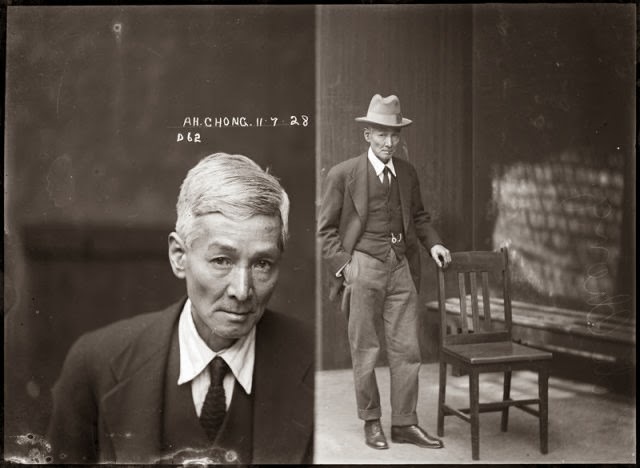 He appears later in the 1933 NSW Criminal Register, cited as associating with the leading lights of the Darlinghurst criminal milieu, including Kate Leigh, Harold Tarlington and ‘Chow’ Hayes. His entry concludes: (i) may be described as an unscrupulous criminal, who will lend his hand to any unlawful undertaking, irrespective of its nature, and invariably assaults, or endeavours to assault, police effecting his arrest. (ii) Addicted to drink, a constant companion of prostitutes, frequents houses of ill-fame, wine bars and hotels in the city and its immediate surroundings, generally Surry Hills and Darlinghurst particularly. 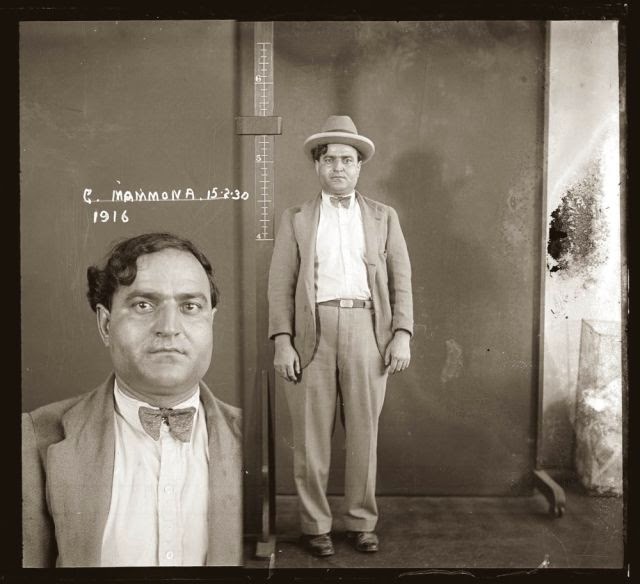 Although labelled ‘G Mammona’, the mug shot shows Giuseppe Mammone, who was presumably interviewed and photographed in connection with the stabbing murder of Domenico Belle on Newtown Station, on the morning of 11 February 1930. Earlier that day Belle had attempted to collect a debt of 15 pounds from Mammone, who ran a barbershop in Leichhardt. It was revealed at the coronial enquiry that Mammone had previously served time in Buffalo, New York, for manslaughter. Newspaper stories of the time repeatedly refer to Mammone as the main suspect in the case, although he was not charged. 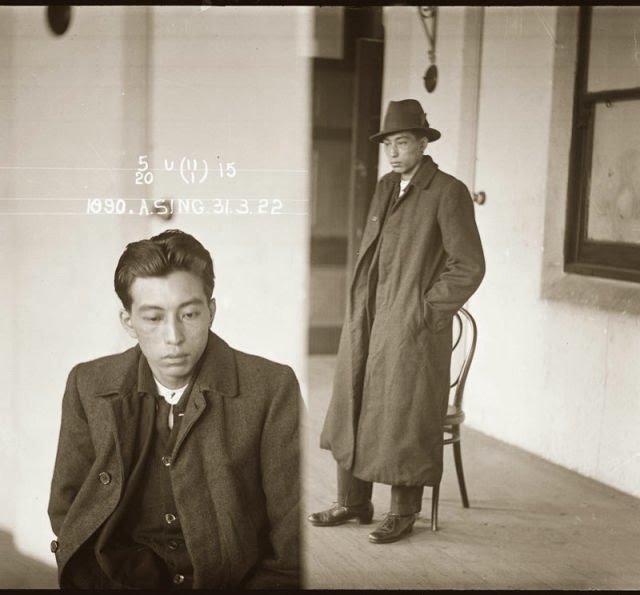 Sidney Langby, 18, was one of a group of seven young men convicted in early 1925 of a series of break and enters in Sydney. Langby was charged with stealing watches, clothing and money from shops and with stealing a motorcycle and sidecar. He received 18 months hard labour on each charge. 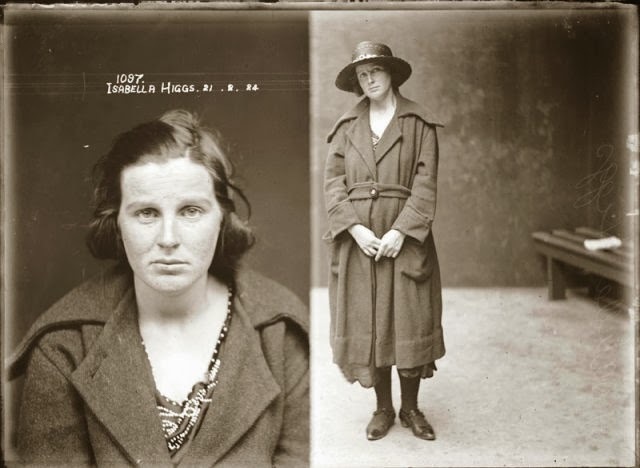 Hazel McGuinness was charged along with her mother Ada McGuiness with having cocaine (in substantial quantities) illegally in her possession. Police described a raid on the McGuinnesses’ Darlinghurst house during which the mother Ada threw a hand bag containing packets of cocaine to her daughter, shouting, ‘Run Hazel!’. 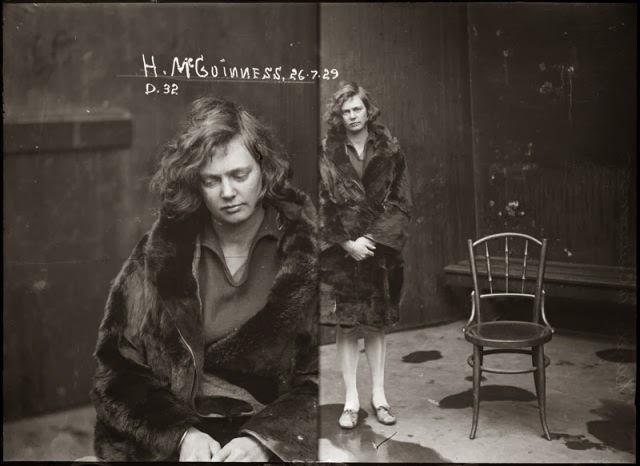 Despite that, detectives spoke up for Hazel McGuinness in court, arguing that she had been led into crime by her mother (‘the most evil woman in Sydney’) who had raised her in ‘an atmosphere of immorality and dope’. Hazel was given a suspended sentence. Enraged over his wife’s participation in a Surry Hills based ‘free love religious cult’ (variously called ‘Abode of Love’ or ‘Free Love Mission’ by the newspapers, or ‘Apostolic Faith Mission’ by its leader), Daniel Ligores, Salvation Army cook, of 110 Palmer Street Darlinghurst, shot his wife Gertrude Grace Ligores dead at the mission’s premises in Holt Place, off Elizabeth Street, in late November 1920. 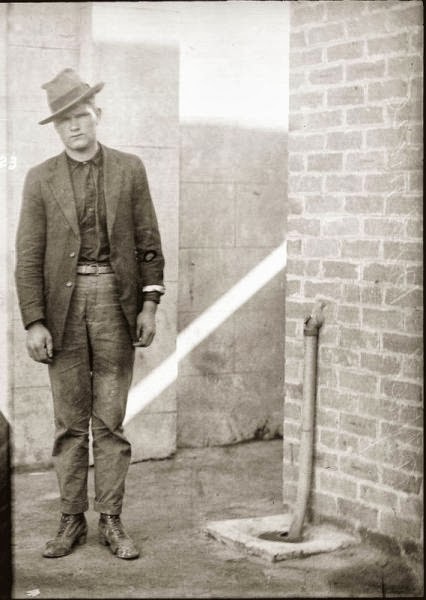 Spencer Cornford, 19, was one of a group of seven young men (see also Sidney Langby) convicted in early 1925 of a series of break and enters. Cornford was charged with stealing watches, clothing and money from a shop and with stealing two separate motorcycles and sidecars. He received 12 months hard labour on each charge. 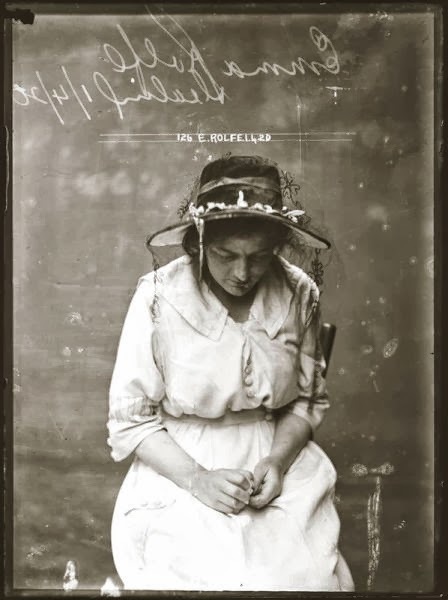 Thomas Bernard Hooper (39), Harold George Hooper (34), Vera Crichton, (23), and Nancy Cowman (19) are listed in the NSW Police Gazette 24 March 1924 as having been charged with “conspiring together to procure a miscarriage” on Isabella Higgs. The women in the case were eventually put on good behaviour bonds. The Hooper brothers received gaol sentences of 12 and 18 months hard labour respectively. 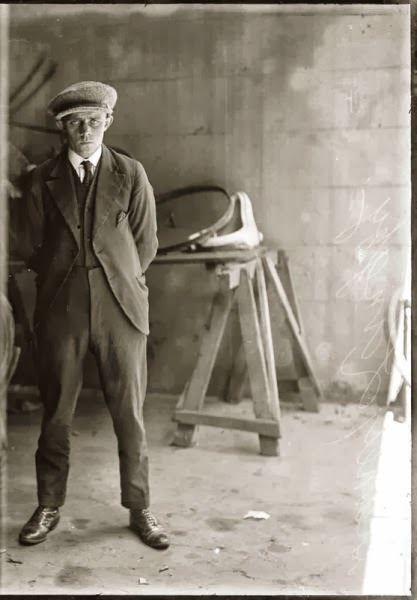 On 1 May 1922, a month after this photograph was taken, Albert Sing was sentenced to 18 months hard labour on three counts of receiving stolen goods, including fountain pens, cutlery and clothing. 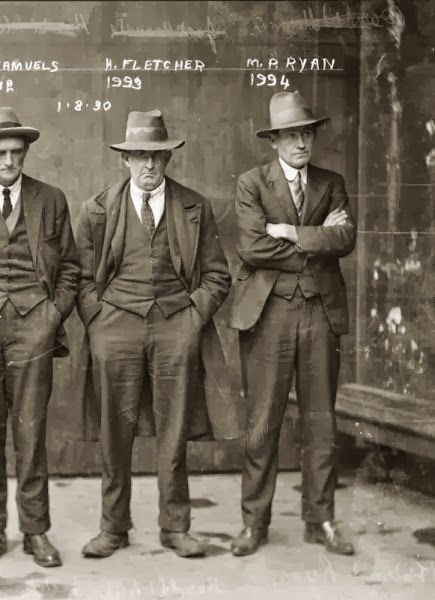 Robert McFarlane (the middle man in this trio) is mentioned in the Police Gazette, 7 September 1921 in connection with the theft of ‘three clocks, two sports coats and other articles’ from the warehouse of Dobson Franks Ltd. He appears in the NSW Criminal Register (24 September 1930) as a ‘thief and petty larcenist’. His MO includes visiting foundries with a horse and cart and stealing ingots of iron copper and tin. He also ‘steals laundered articles from clothes lines’. He is described as being of ‘violent disposition’, ‘addicted to drink’ and is said to associate with ‘the vagrant class’. 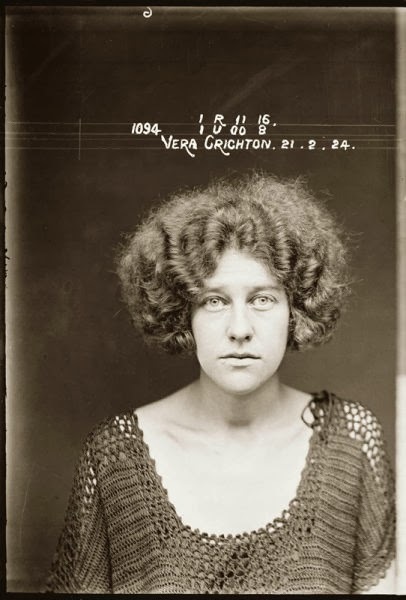 Greta Massey was an energetic impostor, forger and ‘hotel barber’ whose aliases included the surnames Gordon, Spencer, Crawford, Robins and Simpson as well as ‘Nurse Campbell’ and ‘Nurse Nicholas’. 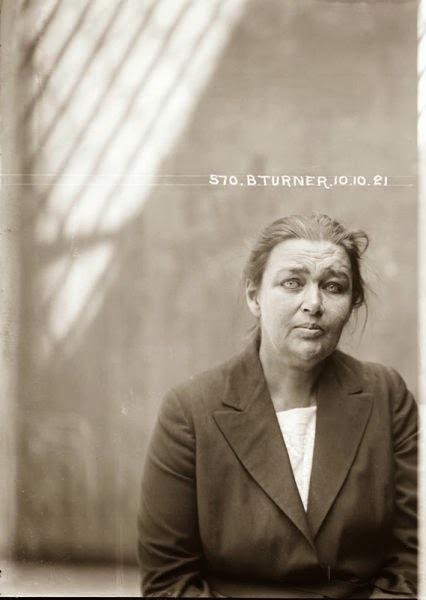 Barbara Turner (alias Tierney, Tiernan, Taylor, Florence Gillespie or Jessi Turner, sometimes known as Barbara Turner Taylor) was a ‘confidence woman’ who operated in Sydney, Newcastle, Brisbane and Perth from the 1890s until the 1920s, and possibly beyond. 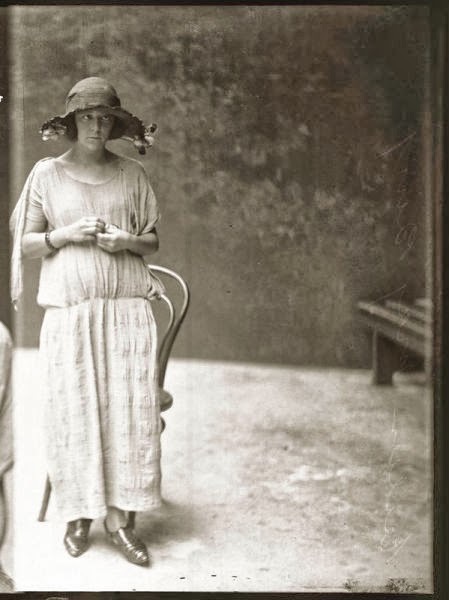 This photograph was taken after she was arrested for defrauding one Henry Placings in Sydney of 106 pounds, by borrowing against a forged cheque, for which she received a year’s imprisonment. 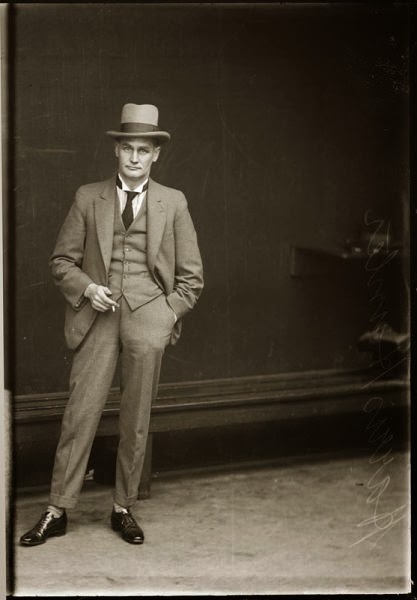 This photograph was apparently taken in the aftermath of a raid led by CIB Chief Bill Mackay – later to be Commissioner of Police – on a house at 74 Riley Street, ‘lower Darlinghurst’. Numerous charges were heard against the 15 men and women arrested. Lessee Joe Bezzina was charged with ‘being the keeper of a house frequented by reputed thieves’, and some of the others were charged with assault, and with ‘being found in a house frequented by reputed thieves’. 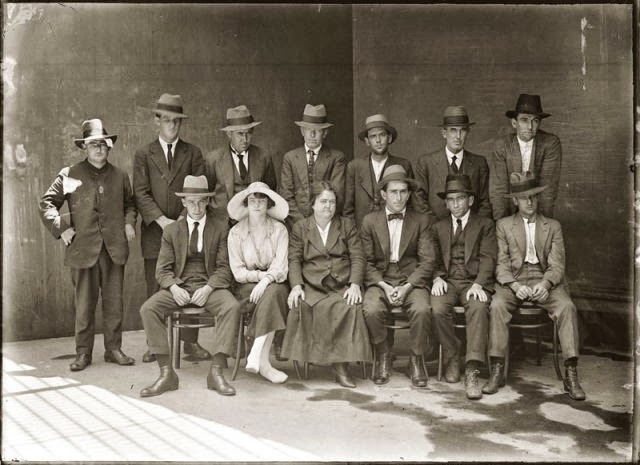 The prosecution cast the raid in heroic terms – the Chief of the CIB, desperately outnumbered, had struggled hand to hand in ‘a sweltering melee in one of the most notorious thieves’ kitchens in Sydney’. The defence, on the other hand, described ‘a quiet party, a few drinks, some singing … violently interrupted by a squad of hostile, brawling police’ (Truth, 29 January 1928). The gallery was packed with friends of the accused, who loudly jeered the prosecution and police witnesses. 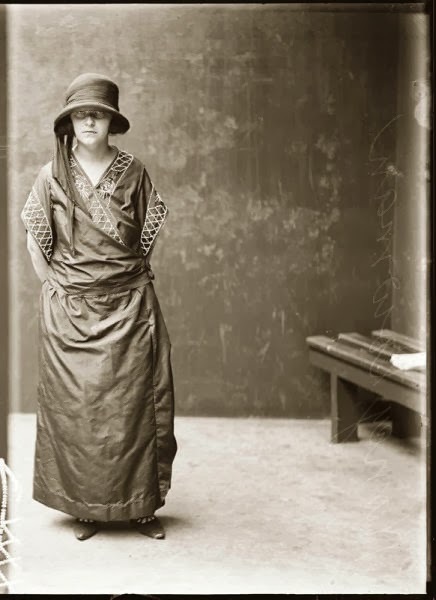 The NSW Police Gazette of 30 January 1924 mentions Eileen May Burt, 18, being sentenced to seven days hard labour for stealing, but released under the first offender provisions of the Crimes Act, and charged to be of good behaviour for 12 months. Later that year a warrant was issued for her having breached those conditions and a further entry in October lists her as having been arrested and charged, but then released with a caution. Harry Chapman was charged with stealing a motor cycle and side car (value 175 pounds) and a till containing money, value 17s. 6d, in league with Harold (‘Tarlow’) Tarlington (15) and Alfred Fitch (17). 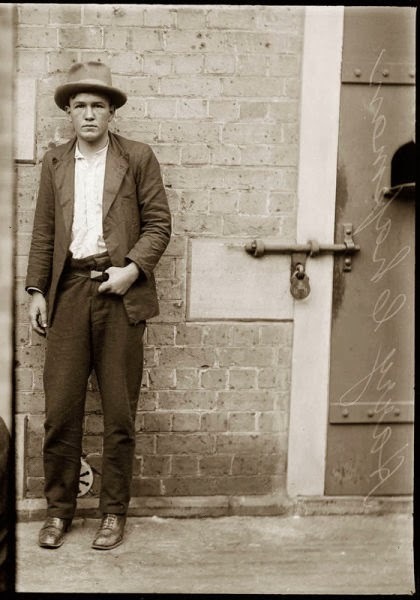 Tarlington went on to become a well-known criminal and was eventually shot dead in St Peters by Myles Henry ‘Face’ McKeon, who was himself later shot dead in Chippendale. 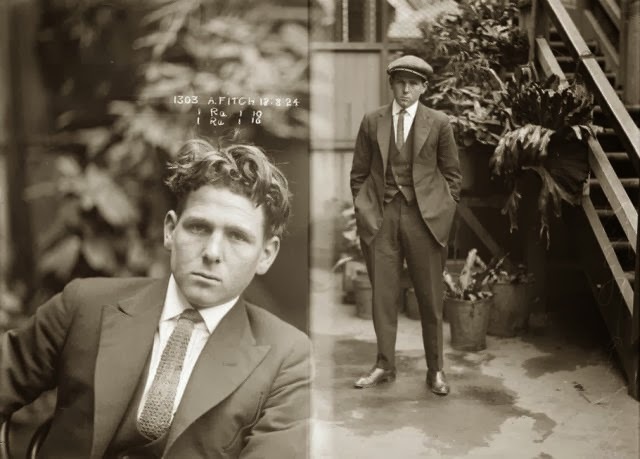 Fitch also went on to become an active member of the Sydney underworld (see ‘Mug shot of Alfred Fitch’ in this collection). Chapman was sentenced to two years hard labour for the motor cycle theft. The NSW Police Gazette 29 October 1930, p. 827 lists Blake as ‘charged with having cocaine unlawfully in her possession.’ She was sentenced to 12 months imprisonment and fined 250 pounds. No entry for Reid appears in the NSW Police Gazette for this date, but he is cited there nine months later as having been released on license following a conviction for assault in January, and for unlawfully supplying cocaine in February. 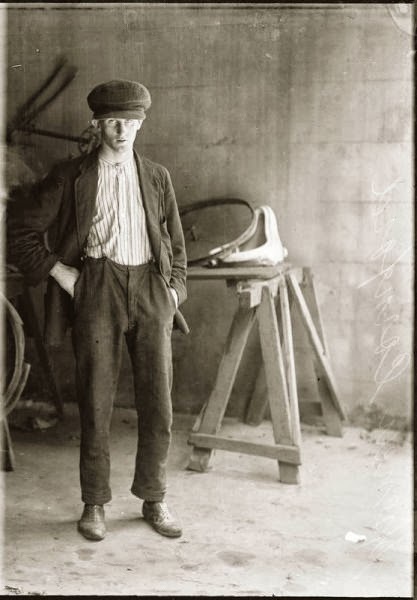 He is described as being five foot seven in height, and of ‘fresh’ complexion; a blacksmith by trade. 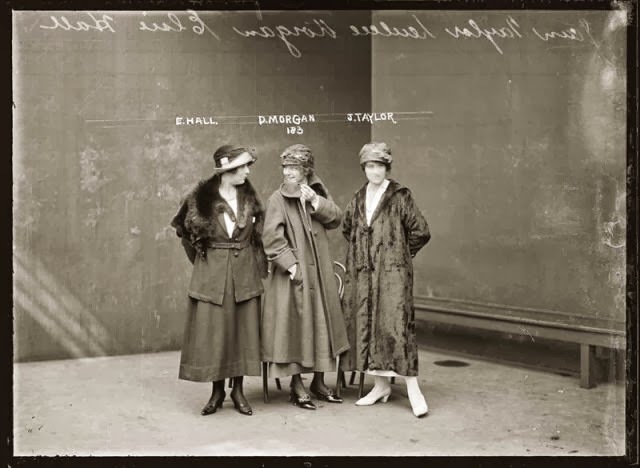 B. Smith, Gertrude Thompson and Vera McDonald 25 January 1928. The serial numbers of this and the ‘Mug shot of Elsie Hall, Dulcie Morgan, Jean Taylor’ run in sequence, suggesting they were taken on the same day and, judging from the lighting, at the same time of day. None of the names appears in the Police Gazette except for Dangar, which turns out to be an alias for Owen Patrick Brosnan, (also known as Brosnahan, or Brosner), a false pretender and ‘suspected person’. 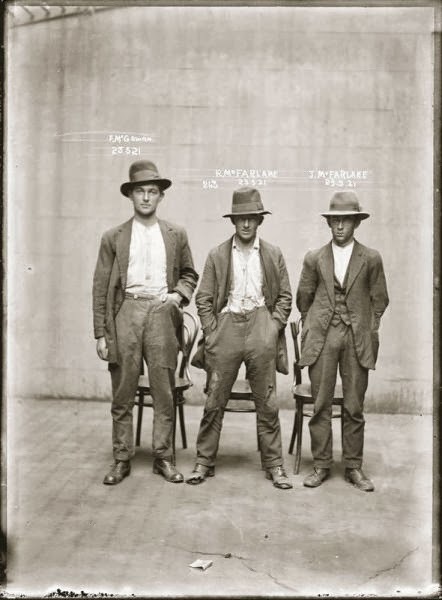 An earlier mug shot of Brosnan shows him to be not the man on the right in this group of three, as inscribed, but rather the offhand individual in the centre, here identified as ‘A Wyatt’. 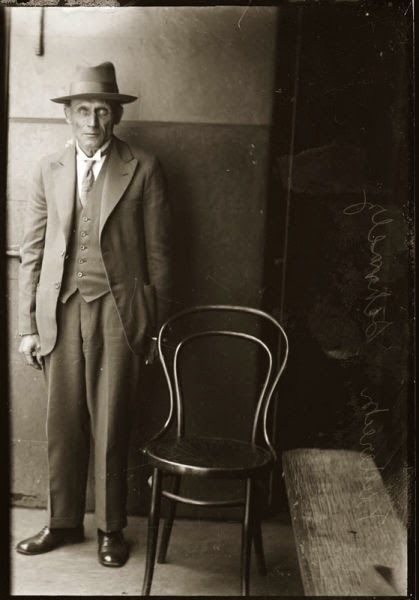 The ‘D’ prefix on the serial number indicates that the photograph was taken on behalf of the Drug Bureau, which in the late 1920s consisted of two men, Detectives Wickham and Thompson. 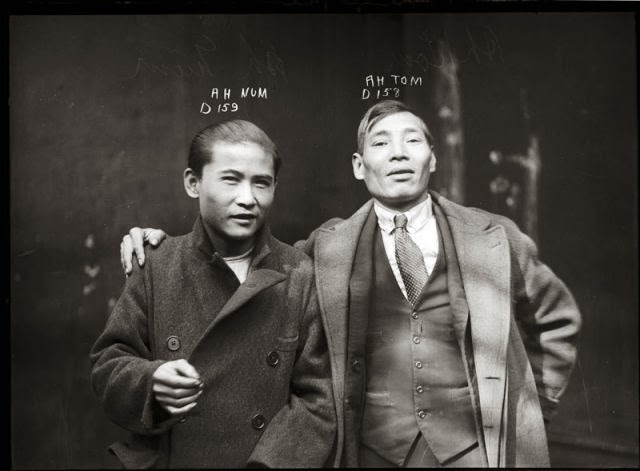 ‘Ah Num’ and ‘Ah Tom’, which may be approximate renderings of these men’s names, do not turn up in the records of the time, and the expectation that they were to be released may account for their obviously elevated mood. 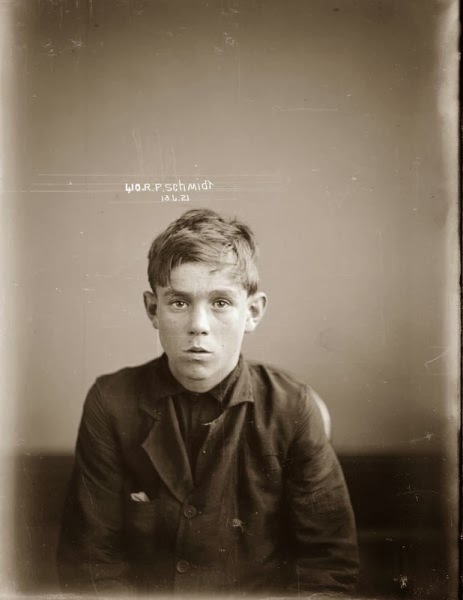 0 responses to "Vintage Mug Shots of 1920s Criminals (40 pics)"